^ "The Lamb & Flag - Fuller's Pub and Restaurant London". lambandflagcoventgarden.co.uk. Retrieved 5 February 2019. ^ a b Peschel, Bill (18 December 2008). 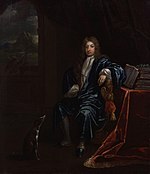 "John Dryden Suffers For His Art (1679)". Bill Peschel. Retrieved 5 February 2019. ^ "Dryden". London Remembers. Retrieved 5 February 2019. ^ Auden, W.H. (2007). "New Year Letter". In Mendelson, Edward (ed.). Collected Poems. Modern Library. p. 202. ^ Johnson, Samuel (2009) [First Published 1779]. "Dryden". In Greene, Donald (ed.). Samuel Johnson: The Major Works. Oxford University Press. p. 717. ISBN 978-0199538331. ^ One or more of the preceding sentences incorporates text from a publication now in the public domain: Stephen, Leslie (1888). "Dryden, John". In Stephen, Leslie (ed.). Dictionary of National Biography. 16. London: Smith, Elder & Co. pp. 66, 73–74.